The lineup for the 3rd Season of Asian Pop-Up Cinema, the Contemporary Asian Film Festival here in Chicago, has been announced and they are some of the films are some of the best from their respective countries. In fact, I listed one of them as my favorite film of 2016 (so far) back in June. Running from September 17 to December 4th, 2016, this season features 12 award-winning films and 9 Chicago premieres. There will be Q&A sessions with visiting directors following many of the screenings, moderated by “Cinema Slapdown” host, Ron Falzone. Below you will find the press release for the festival and a full schedule. Film has the power to bridge cultural divides. With that goal in mind, the third season of Asian Pop-Up Cinema showcases a wide range of movies designed to connect moviegoers and broaden understanding of Asian culture. Audiences will enjoy meticulously selected films rarely shown in American theaters and meet three Directors coming to Chicago with their films: South Korea’s Lee Ho-jae (“Sori: Voice from the Heart”), Japan’s Yuki Tanada (“Round Trip Heart”) and Hong Kong’s Steve Chan Chi-fat (“Weeds on Fire”). From a heart-warming sci-fi drama to a Cannes Film Festival honored martial arts masterpiece, this season’s lineup includes films from China, Hong Kong, Indonesia, Japan, Korea, Philippines, Taiwan and Tibet. “Since our inauguration in the fall of 2015, Asian Pop-Up Cinema has presented two North American premieres, twelve Chicago premieres and a total of eighteen contemporary Asian titles. Films from Hong Kong, China, Taiwan, Korea, Japan, Thailand and Vietnam and five prominent filmmakers were presented at the Season I & II. We are pleased to expand the horizon by adding films from the Philippines, Indonesia and Tibet in Season III, ” says Festival Founder and Executive Director, Sophia Wong Boccio. 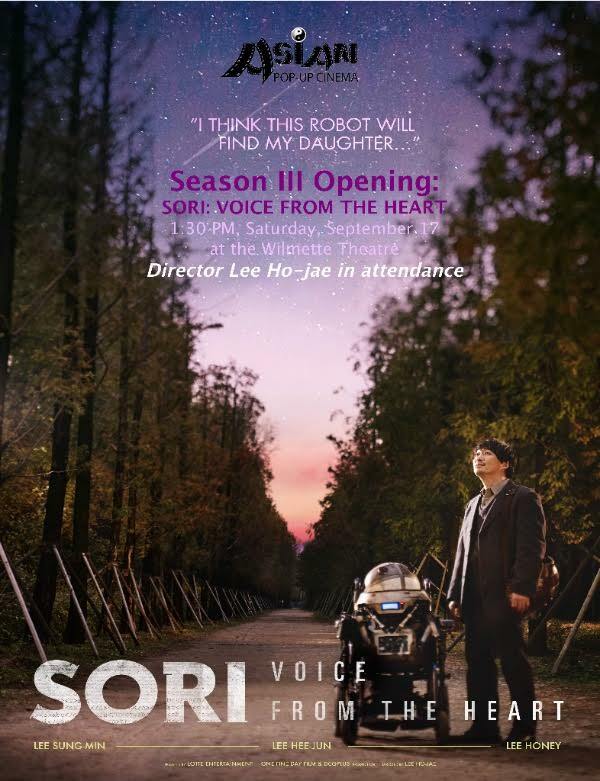 Opening Night Film: SORI: VOICE FROM THE HEART –CHICAGO PREMIERE! Saturday, September 17, 1:30 PM at Wilmette Theatre (followed by an afternoon tea party at the lobby of the theatre). Suitable for all ages. WEEDS ON FIRE – CHICAGO PREMIERE! Unexpected events in their daily routine of crime and survival in the busy streets of Manila lead to dramatic changes for a gang of street kids. Performed by the talented young cast with Teri Malvar (15-yr old) winning the Best Actress Award at the Moscow International Film Festival 2016, “the film lays bare the sad reality of an ill-ridden society but also offers some hope for the future”. The Director also won the Russian Film Critics’ Jury for the Best Film award. “Wong Ka Yan” tells the story of an overgrown kid lives on the outlying island of Peng Chau in 1992. Chan Chun-yin falls in love with a movie ticket seller after getting trapped inside the cinema. When he returns to find the girl has quit her job, he sets off on a quest to find her, despite the odds given her very common name. Shot with washed-out color showing Ping Chau as this relaxing rural atmosphere, the film transmits a sense of old-timey charm and innocence that is universal. 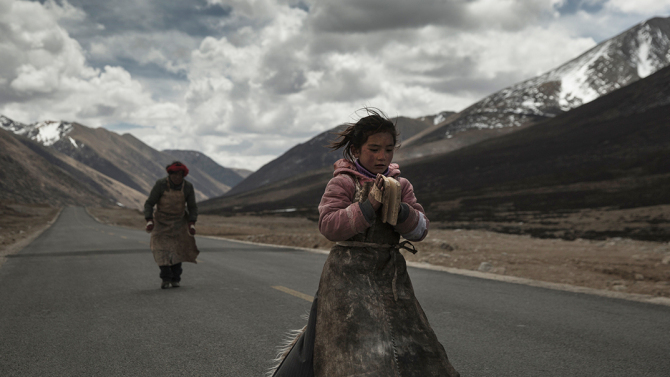 Shot over a period of a year with no script, critically acclaimed “Path of The Soul” follows 11 friends, neighbors and relatives on a soul-searching pilgrimage to Lhasa and the sacred Kang’s Mountain. 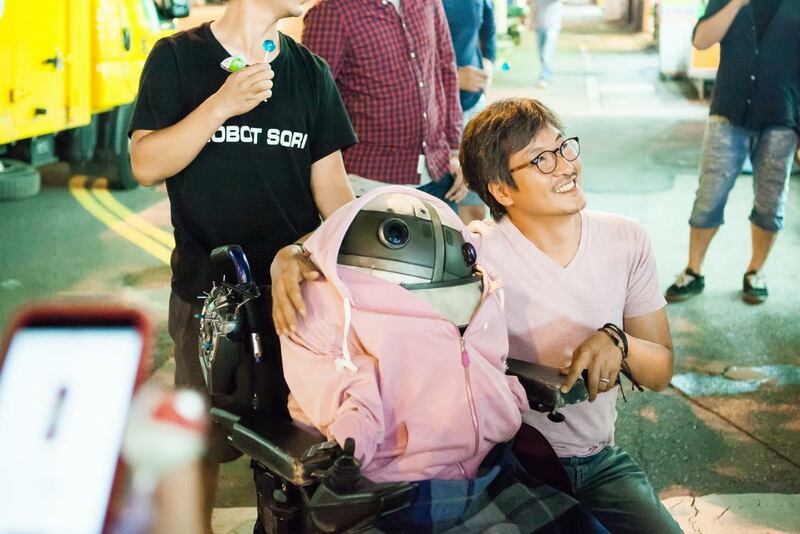 The film was rated 4th favorite by the audiences of 2016 Rotterdam International Film Festival audience – a film that upends the traditions of documentary that Asian Pop-Up Cinema is proud to showcase it on the big screen again. WHEN THE CURTAIN RISES – CHICAGO PREMIERE! “When The Curtain Rises” focuses on the process of putting on a theatrical play by a high school drama club in a provincial town, following the growth of its actors both on stage and personally. The five young leading actors, are members of the idol group Momoiro Clover Z, and their learning curve as actors overlaps with that of their characters in the film. 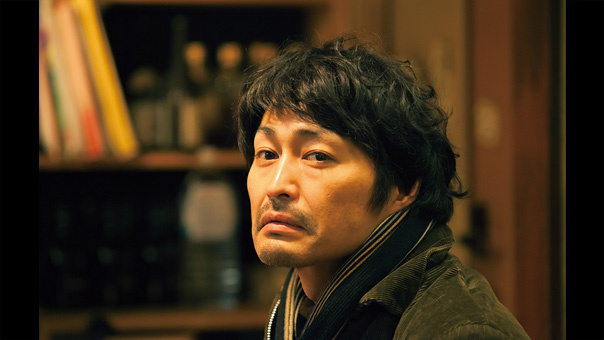 Only 24 at time of filming who plays the new coach, Kuroki Haru, has already amassed an impressive list of acting honors including the Berlin Film Festival’s Silver Bear for Best Actress Award in 2014. “Siti” tells the story of a beautiful young woman caring for her paralyzed husband, her son and her mother-in-law, by selling snacks at the beach for tourists and selling herself at an illegal karaoke bar in the evenings. Her life is further complicated when a policeman falls in love with her. In this tense supernatural thriller, locals become suspicious after a foreigner mysteriously appears in a quiet rural village. Suspicion turns to hysteria and investigators look to a shaman for clues after a series of brutal killing sprees. “The Wailing” smashed box office records when it debuted in South Korea and many audience members saw the film several times searching for new clues in this highly talked-about ending. A FOOL – CHICAGO PREMIERE! 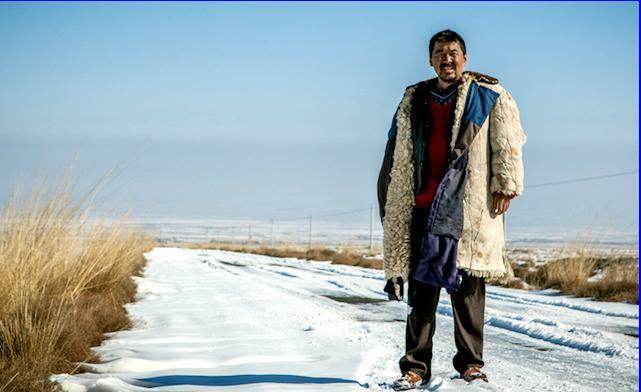 Well-known Chinese actor, Chen Jian-bin makes his directorial debut in this film about a goat farmer finding the real family of a mentally handicapped young man who follows him home one day. A Foolearned Chen Best Actor and Best New Director prizes at the 2014 Golden Horse Awards in Taiwan, but the real-life arrest of one of the supporting actors delayed the release, adding an ironic twist to the movie’s message about morality. THE ACTOR – CHICAGO PREMIERE! “The Actor” follows a “bits parts” actor, played by Ken Yasuda, best known for TEAM NACS (a group of 5 actors) and many voice performances as in award-winning animation Spirited Away, who finally gets a break with a big role by an internationally known director – a basic plot that may sound familiar yet with the inspired performances and the romantic subplot, director Yokohama’s take is anything but conventional. Back with his first film in 8 years, Hou Hsiao-hsien wows the film world with an awe-inspiring take on the traditional martial arts film. In 2015, “The Assassin” garnered top awards at all major film festivals in Asia, and won the prestigious Best Director Award at the 2015 Cannes Film Festival. 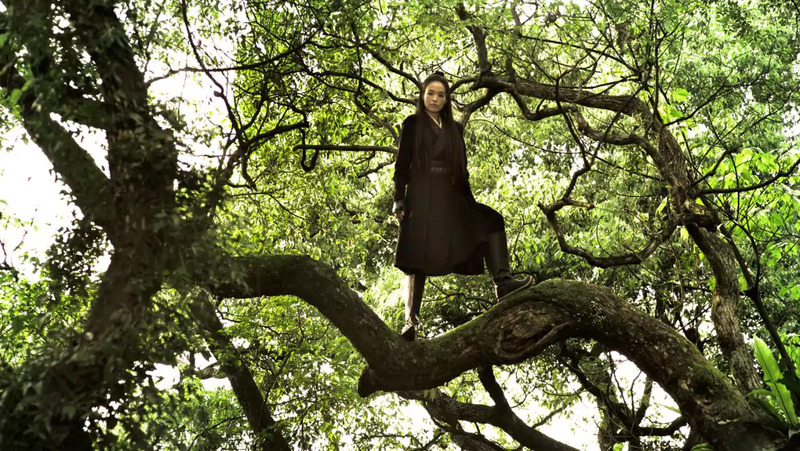 Asian Pop-Up Cinema is proud to present “The Assassin” on the anniversary of its debut North American release. Closing Night Film: ROUND TRIP HEART – CHICAGO PREMIERE!